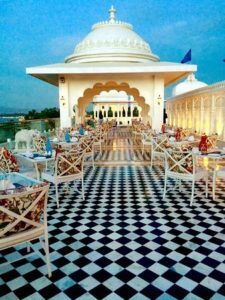 Upre restaurant by 1559 AD is one of the top-rated rooftop restaurants to enjoy dinner and drinks in Udaipur which is located on the terrace of Lake Pichola hotel facing city palace. Upre offers a breathtaking and amazing view of the lake along with the light music. The hotel is almost 95 years old but still continuing its beauty from past many years. The restaurant offers a variety of local and international cuisines, wine & cocktails. The ambience of the restaurant is extremely pleasant and gives you a romantic atmosphere. Managers and staff is cooperative. Go with your friends and family and enjoy every moment to make it memorable. Sun and Moon restaurant located on the rooftop of Treebo Udai Niwas hotel. It is the highest rooftop in the area which gives the beautiful view of lakes and city. The restaurant is in the centre and surrounded by many famous places. You can go before the sunset to enjoy the view amazing view. The restaurant serves multiple cuisines and provides best and fast service. So if you want to enjoy some time with your friends and close ones so, it is the right place for you. 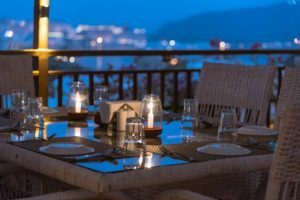 Vantage restaurant by Panna villas is one of the best restaurant located near Fateh Sagar and situated on the trident road. The restaurant offers delicious multi-cuisine food and offers a various greater choice of vegetarian and nonvegetarian with beautiful and modern ambience. The ambience of the restaurant is so friendly so that guest are invited to dine at any of the days. 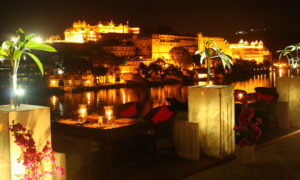 The place gives the wide and beautiful view of the lake city with the live ghazal performance and music mostly in night times. Location: Viaan, G-14 Above Hotel, Trident Road, Haridas Ji Ki Magri, Shavri Colony, Udaipur, Rajasthan 313001. Notomoro means live like as there is no tomorrow is a new and modern concept of capturing the hearts of people. 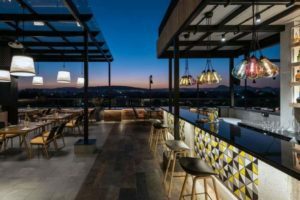 A new bar and rooftop restro have opened at the top of the fern residency hotel which gives a fantastic and wide view of covering entire lake city. The place is famous for its unique concept of drink, eat and repeat. The place offers a variety of drinks and mocktails to make people feel relax and chill. If you are interested in watching sunsets then you must go, enjoy the light music and food. The ambience and structure of the place is very unique and classy with a great concept and friendly staff. So what you are waiting for. Go and explore! Aravali Lakeview is located on the rooftop of Radisson Blu hotel. The restaurant has live music set up to enjoy your evening with mesmerizing ambiance. 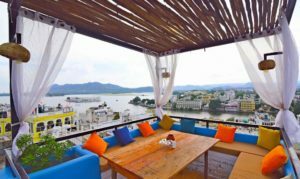 The place offers the excellent view of Lake Pichola, Fateh Sagar, and monsoon palace. 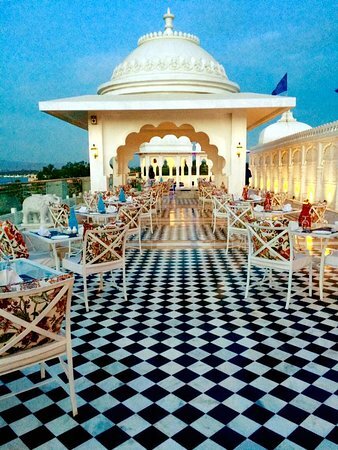 Being the restaurant surrounded by the lake, the ambiance of the palace gives romantic and chill feels. So what you are waiting for? Make your eve a memorable one by visiting Aravali Lakeview with your friends, family and loved ones. Dine and feel like you are at the top of the world!